I know that SCCM 2012 can install the Endpoint Protection if defined in policy, but sometimes it is better to be in full control, and have protection up and running with the latest definitions as soon as your OS has been deployed. 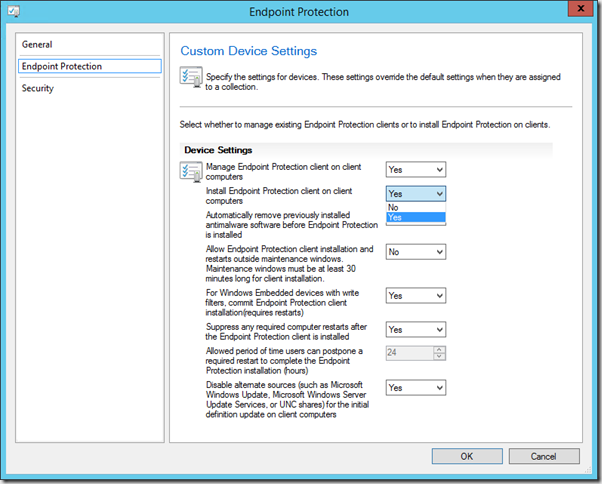 To be able to manage your EP clients from SCCM once they are deployed, you need to configure SCCM Client Settings for Endpoint Protection and deploy them to collections containing your computers. 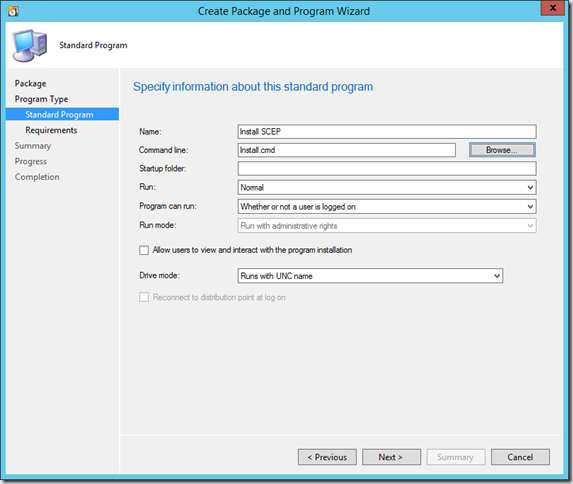 You can define the EP settings as either just manage existing clients, or to install the EP client. 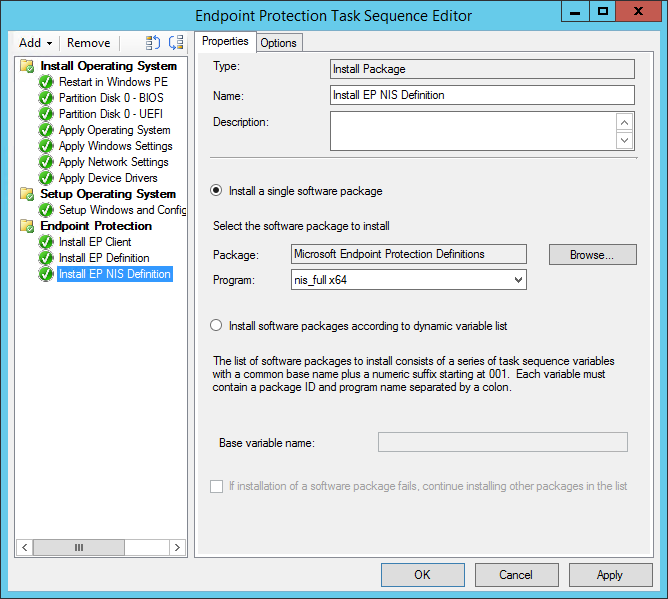 If install EP client is selected the client installed by the Task Sequence will not be reinstalled, just managed. 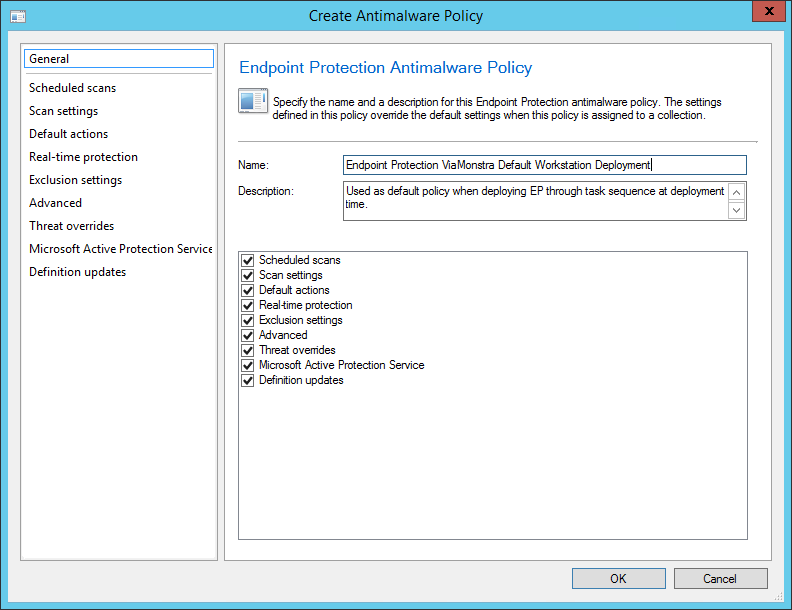 During installation we will supply a default Endpoint Protection policy so EP knows how to behave when first installed. <ConfigMgr installation path>\AdminConsole\XmlStorage\EPTemplates and locate and import the SCEP12_High_Security.xml template (or use any other template that you prefer). Now we can modify the policy to our hearts content, giving it a more saying name, setting default scan schedules, adding exclusions etc. Click OK when done. Now export the new policy by selecting it and clicking export on the ribbon. Save the file as ep_defaultpolicy.xml (or use any name that you prefer, I just replace the default file in the installation source to make it easier). To install the Endpoint Protection client in the task sequence, we need to create a package with the installer and the default policy we just exported. Create a source folder for the package content in you usual location, and copy the following files from <ConfigMgr install dir>\Client folder and the path of your newly saved policy to your new content folder. Create a new textfile named Install.cmd and edit it. 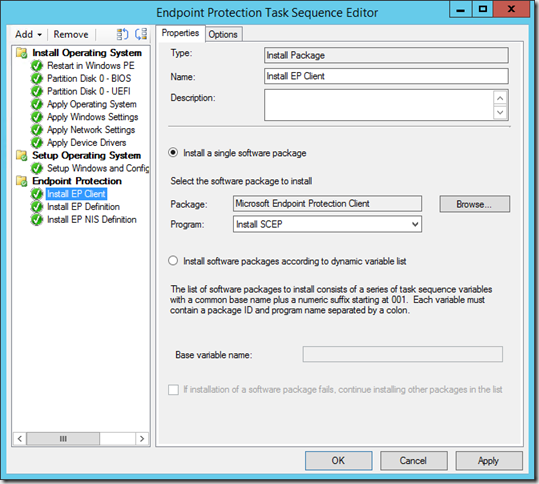 Enter the following line to install the EP client and make it use the supplied policy. Save and close the file. (make sure file extension is .cmd not .txt). /NoSigsUpdateAtInitialExp – Suppresses the initial download of definition files from external sources. We will supply the most recent definitions in the task sequence just after installing. so no need to download. 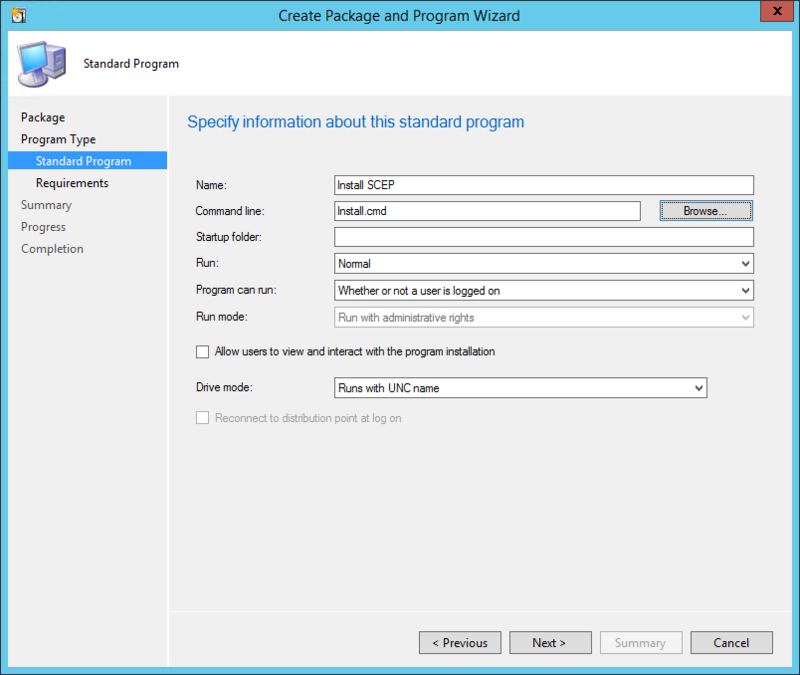 /policy – Specifies which policy xml file to use. 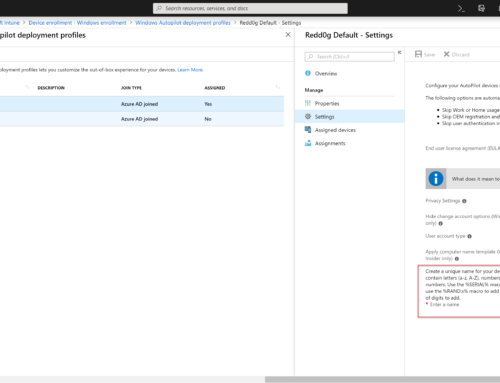 This parameter requires a fully defined path to the xml file, so we use a CMD file and the %~dp0 argument to locate the current path relative to our package at deployment time. Edit the ep_defaultpolicy.xml with a text editor of your choice. Insert the following line in the “Antimalware\Signature Updates” policy and save the file. (please note that xml is case-sensitive). 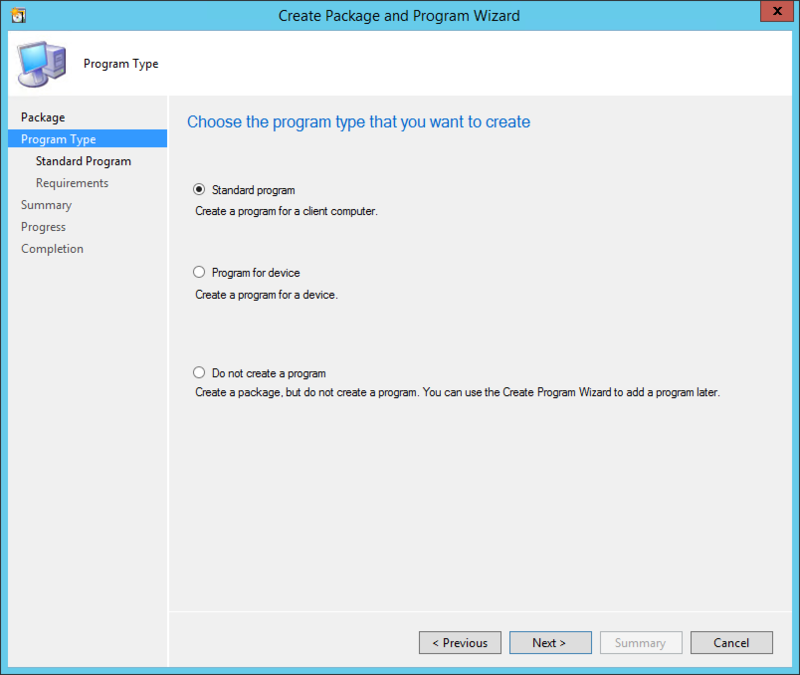 Now create a package for the installation. Name the program and select Install.cmd for the command line. Make sure the program is set to run Whether or not a user is logged on. Finish the wizard and distribute the package to your deployment points. Next we need to download the latest EP definitions to install in our task sequence. We need to edit the script to tell it to download the files to our new folder. 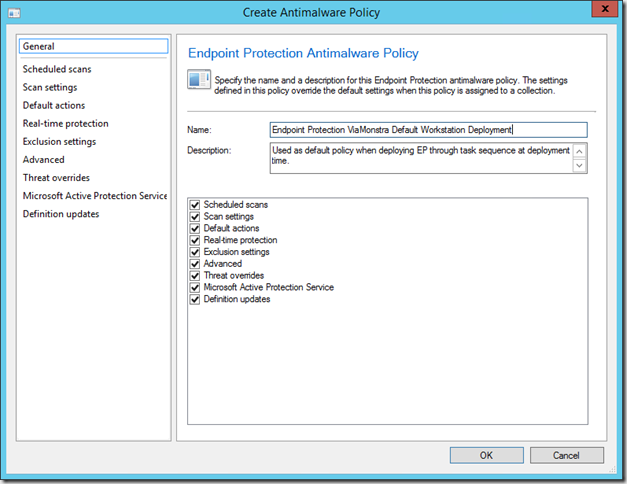 Place the script in the root of your new “Endpoint Protection Definitions” folder. Execute the script (double-click) to download the newest definitions. You can now schedule the script through Windows Task Scheduler to be executed at an interval of your choice. Once a day is what I use. 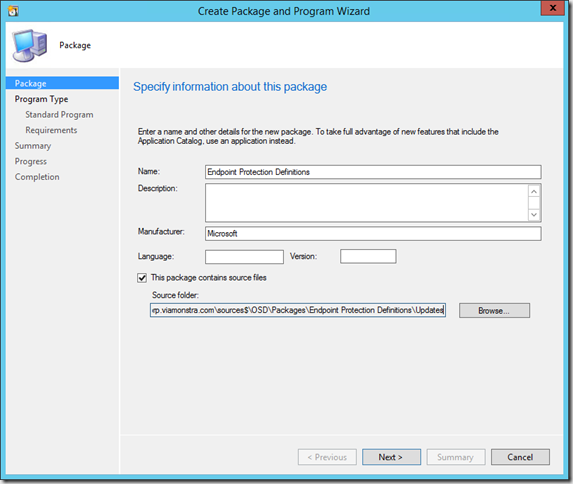 Now we need to create a new package to install our downloaded definitions. 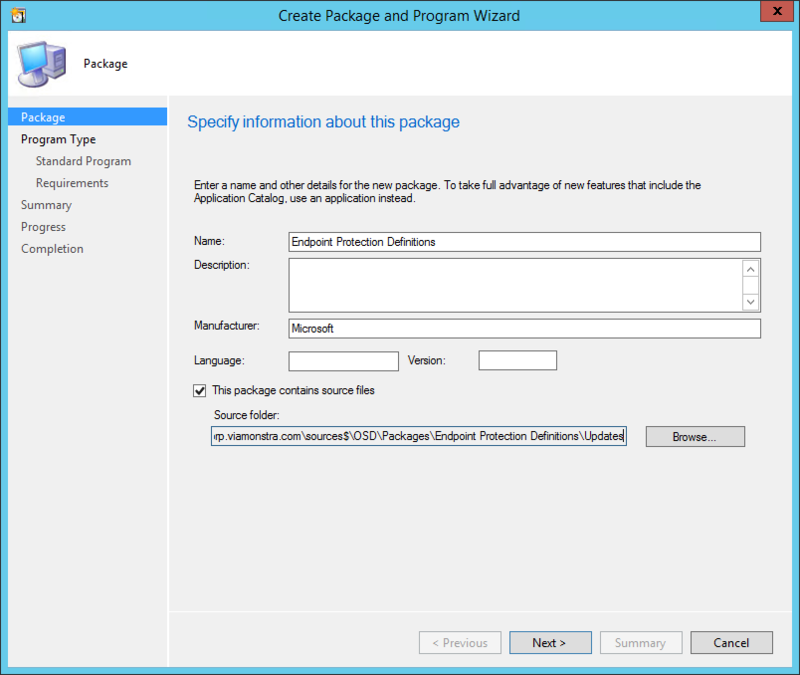 Name the package and specify the source folder we just created, Use the Updates subfolder as the source. Select standard program for the first of 4 definition installers. Name the Program and select the first definition update, in this case the mpam-fe.exe from the x64 sub-folder. Make sure the program is set to run Whether or not a user is logged on. Finish the wizard and add programs for the remaining 3 files as shown here. Distribute the package to your distribution points, and change the properties of the package to distribute the content on a schedule set accordingly to your script schedule. Next add two install package steps to install the definition files that matches the platform of the OS being deployed. Now sit down and relax, have a cup of java and rest assured that newly deployed computers are protected by Endpoint Protection as soon as they are deployed. I continue to get a 0x8004FF6C error. The policy file “xxxxxx” was not found or could not be validated. Where can I download the lastest SCEPinstall.exe (4.8)? I only have an old one. If this thread is still alive. When my update steps run in the sequence they fail with multiple reasons, which I get for both 32bit and 64bit sequences for multiple OSs 7 and 8 mostly. I have had the error of mpam-fe.exe / nis_full.exe is not a valid Win32 application. I’ve also gotten “catastrophic failure” and “unspecified error”. The only thing I haven’t gotten is a successful update. My package and program are setup step by step from this page, obviously I changed all the appropriate information to my environment. Also, there is also the mpam-d.exe, which I don’t have in the sequence. Should I be attempting to deploy that one as well, if so what order? 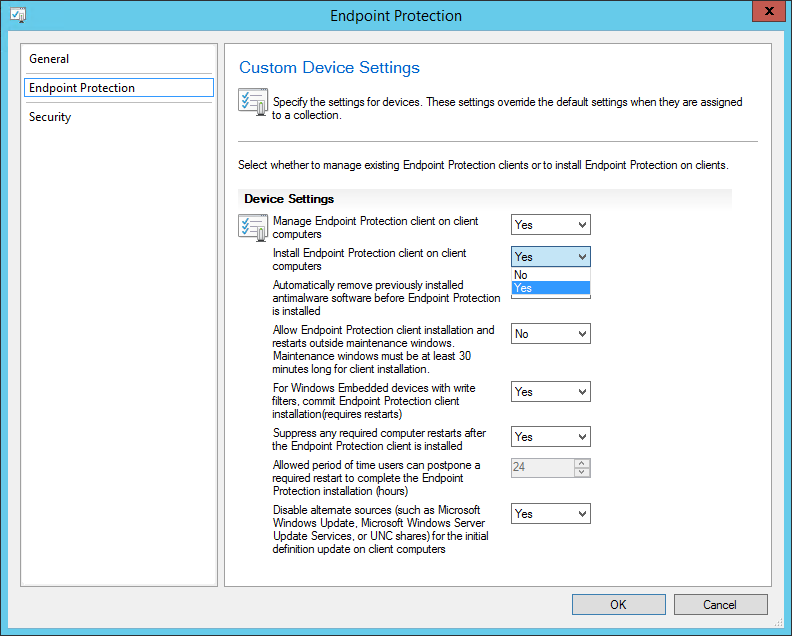 But as others also wonder, can we import the endpoint protection policy to Windows Defender in Windows 10 during task sequence deployment? This work like a charm. Thank you!